A reader’s complaint about Microsoft Security Essentials (MSE) spurred head-to-head comparison tests of AV-software resource usage. I put six popular, free antivirus tools through their paces and measured their impact on startup and shutdown times, disk space, and RAM use. Normally, reader letters appear in the LangaList Plus section of this newsletter. But sometimes, one comes along that warrants treatment in greater detail. “Occasionally you either recommend or suggest Microsoft Security Essentials as a viable free alternative to commercial anti-malware programs without mentioning the also-free competing products such as AVG and Avast, to name just two. “MSE is an enormous resource pig, adding a full 30 seconds or more to boot times. Many Windows users look to Windows Secrets for tips and tricks to improve performance. Based on my experience, MSE does more to hobble overall system performance on supported platforms than to improve it. As the Windows Secrets author who has recommended MSE more than any other contributor, I was alarmed by Bill’s letter. I decided to run a series of head-to-head tests, comparing MSE’s resource usage to other popular, free antivirus tools. Because MSE is completely free, I chose to compare it against programs that also are truly free — no strings (such as free trials of commercial programs) attached. I chose software that, like MSE, is specifically designed for malware protection — I didn’t include integrated, do-it-all security suites. To make the selections, I used popularity ratings from several sources, such as the download stats and user ratings from CNET, MajorGeeks, and other sites. (The rankings and numbers in the list below were current at the time of writing.) I also gave extra weight to products frequently mentioned by readers and other authors in the Windows Secrets newsletter as well as tools that looked especially promising (as you’ll soon see). Microsoft Security Essentials (site): Because I’ve recommended Microsoft’s consumer anti-malware application in previous stories, I’ve made it the baseline for these tests. Avast Free Antivirus (site): Avast claims its package is the “world’s most popular antivirus.” CNET also ranks it #1 on its download list. Avira Free Antivirus (site): It ranked #2 among CNET users, and it scored an impressive 4.7 out of 5 rating on MajorGeeks. AVG Technologies’ AVG Anti-Virus Free (site): The publisher of this app says it’s used by “over 100 million people.” CNET ranks it at #6 in popularity. Comodo Antivirus (site): Comodo gets very high users rating on both MajorGeeks and CNET. 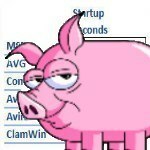 ClamWin Free Antivirus (site): Not as well known as the other AV packages, ClamWin is unique; it’s a free, open-source software project released under the Free Software Foundation’s GNU General Public License. I know there are many other products out there, but I couldn’t test them all. I believe the preceding list is a good sampling. This post is excerpted with permission from Windows Secrets. Windows Secrets anti virus software, AntiVirus, avast, AVG, avira, ClamWin, comodo, Microsoft Security Essentials, windows secrets. permalink. Not a free one but I've found GFI Software's Vipre Antivirus to be the absolute lightest AV around. Vipre uses only THREE processes: a Tray applet which uses almost zero RAM; a Plugin Manager Service that uses even less than the Tray; and the main service, SBAMsvc, which uses from 20M max, to even less RAM. This is using Process Explorer and looking mainly at Working Set Private memory, the stat used by Vista and Windows 7 native Task Manager. For systems that have two to four Gigs of memory, this is a pittance; you'll barely notice it! 1) MSE has gotten much better. No Behavioral blocking and slow updates. 2) Avast-Perhaps the best on the list with sandboxing. 3) Avira-Decent detection with high FP's. 4) AVG- lots of bells and whistles for a free AV. 5) Comodo- extraordinary amount of FP's. 6) Clam-NO realtime protection. Been around since 2005. Not on the list and what I use: Panda Cloud Antivirus. Light on resources and free. MSE is one of the best free AV programs available, and it does practically NOTHING to slow your system down in terms of hogging resources. If your system is taking an extra 30 seconds to boot, that's probably because you're using a computer that was outdated 10 years ago. My laptop boots up in about 10 seconds flat with MSE and a mechanical HDD. What about Trend Micro? Our provider has given us this free. Good or not?